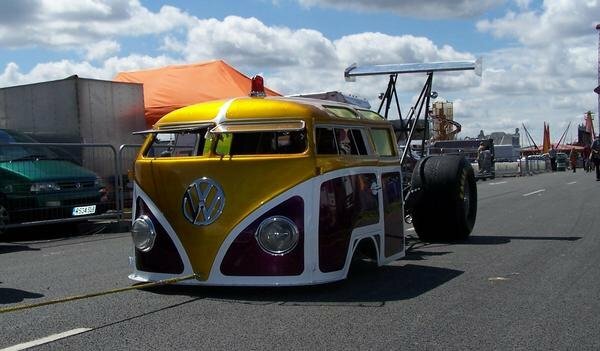 This beast is an incredible VW Bus based dragster called “Mental Breakdown”. It was created by Wayne Allman, founder of dragster and custom car engineering company The Intergalactic Custom Shop based in Warwickshire in the good old United Kingdom. Mental Breakdown is powered by an 8.4 litre supercharged V8 that runs on methenol, which delivers 1,700bhp, and is based on a 1965 VW Camper. Allman has been quoted as saying “”I have always loved installing powerful engines in the wrong cars” which we feel is an appropriate statement. The first video we feature shows it in action with a test run at Santa Pod back in 2012. The second video shows it in slow motion.